My primary profession was an economist. Although it was not the profession of my dreams, I liked to travel and in the communist Czechoslovakia it gave me some opportunity to visit some distant countries, where I lived for 5 years. So through the oriental jambiyas and peshkhabses which I admired in the Middle East I came to knifemaking. I am a full-time knifemaker since 1990. In 1991 I visited my first knife show in Bern, Switzerland. Since this time I'm taking part in many shows in Europe and USA. Since 1996 I am the member of the Knifemakers' Guild. As I am doing a rather elaborate art knives with a lot of carving or sculpturing and I am using mostly hand tools [chisels, hammers...] I am not able to do more than 6 - 10 knives per year. To my favourite themes belong animals, natural nations, mythology and history. So you can see mostly this subjects on my knives, too. Concerning the materials, I like to use stainless steels [ATS 34, 440 C] or damasteel, for handles various fossil materials and nice wood. Some of my knives are inlayed by gold, silver and some alloys of these metals. 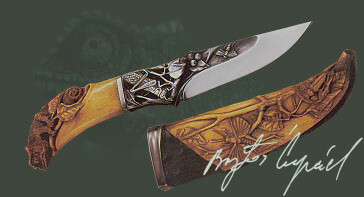 But I think that it is better to see the pictures of my knives as to read this lines, so you are welcome to my website.